Having invasive work done on your face can be scary for so many reasons. I’m not opposed by any means, but if like me, it scares you, I’m here to show you how to make improvements in the privacy and safety of your home. SO – if you have NOT tried the latest tech for non-invasive age management alternatives, OR, you want to nip those little pesky areas in the bud to ward off the need for invasive procedures, you’ll want to read on. First, let me clarify I’m not talking about weak OTC creams or cheap ineffective devices. I only promote proven tips and techniques from my 20+ years as a professionally trained and licensed esthetician. None of that “fake beauty expert” fluff you read in the magazines or see on TV. The lines, wrinkles, folds, and bags we get are due to the supportive muscles (called fascia) in your face getting soft – and – in some cases get stuck. Stuck? Yes! Think, vertical marionette lines on left and right side of your mouth, deep horizontal wrinkles in the forehead. Get the picture? When the face loses collagen and elastin the facial muscles sag. Think…jowls, sagging eye lids, etc. Certain facial exercises can help with this by stimulating blood flow and circulation, plus relieve tension since stress causes frowning, grimaces, etc. But it can have an adverse effect if the movements aren’t right for your specific facial issues. 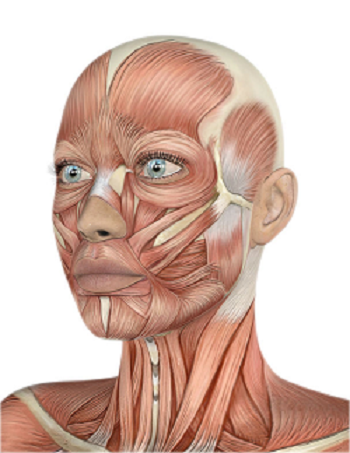 After all, repeated facial expressions cause the muscles in the face to get stuck. Yikes! So you don’t want to do movements that would make this worse. In other words, there is no one size fits all for facial exercises. So what is a reliable method to – release fascia that is stuck – AND – increase collagen and elastin? It’s microcurrent! Microcurrent emits subtle electrical frequencies that mimic the body’s own electrical signals, thereby increasing the amount of ATP (adenosine triphosphate, the chemical fuel of human cells) by as much as 500%. Such increased levels of ATP speed cellular metabolism; the result is a detoxification that increases the rate of waste and impurity elimination. Protein synthesis and cellular membrane transport are also increased, as well as the reconstitution of collagen and elastin. The results of these processes can be seen in improved skin tone and coloration, the reduction of fine lines and wrinkles, and the firming of sagging areas creating a face lift effect. If you want to achieve a non-invasive face lift, find a local, licensed esthetician. If you don’t have one in your area, the next best thing is purchasing a home use device, like the Clareblend Mini. I even use this device in my studio. And, in addition to microcurrent, exercise and drinking plenty of water will significantly boost the effects of microcurrent and other products you may be using. Don’t have a Clareblend Mini? Get one here.